Welcome to the Saints vol 1, book club. The manual is a very different history book of the Church of Jesus Christ of Latter -day Saints. First, it is written in narrative format, which means it is easy reading. Second, while it is inspiring, it faithfully discusses the more controversial issues that were often buried or intentionally ignored in the past. Third, it contains the experiences of several people, particularly women. Fourth, it uses many sources, from Lucy Mack Smith to Bushman’s Rough Stone Rolling to the Joseph Smith Papers Project. Chapter one begins by discussing the 1815 volcanic eruption of Tambora in Indonesia. This brought about the year without a summer in 1816, which forced the Smith family to move from Vermont to Palmyra. The text notes JS sr had various economic struggles, but does not discuss them. For example, in a get rich quick attempt, he spent his fortune on a ship that would bring rare spices and dyes from the Far East. The captain later wrote JSSr saying the ship sank off the coast of Africa, with all the cargo lost. Such events led JSsr into alcoholism, which is not mentioned in the text. The text discusses Joseph’s leg surgery, and the difficult winter journey to Palmyra by Lucy and the children. It explains at length the religious fervor of the Great Awakening, partially inspired by the hardships of the 1816 freeze. For many Americans suffering through the year without a summer, God’s anger was clearly manifest. ,In chapter 2, we learn of the First Vision. Details of Satan attacking Joseph are found in the narrative. We learn of many events from the various versions of the First Vision, such as Joseph hearing footsteps, and Satan harming him, hosts of angels with God, and Christ forgiving Joseph of his sins (1832 FV account). “Once Joseph discovered that sharing his vision only turned his neighbors against him, he kept it mostly to himself, content with the knowledge God had given him. Later, after he moved away from New York, he tried to record his sacred experience in the woods. He described his yearning for forgiveness and the Savior’s warning to a world in need of repentance. He wrote the words out himself, in halting language, trying earnestly to capture the majesty of the moment. This is an example of the narrative that deals with past issues that were ignored by the Church previously. I like that they deal with it briefly, positively, and concisely. It was different for me to begin reading a narrative, as I’m used to reading history books that deal solely in facts, and not adding a level of inspiration. But, as I’ve read 1/3 of the Saints history book, I’ve grown to like this format. I also appreciate it discusses, although sometime very briefly, some of the previously secreted issues, it deals well with many of them, making most issues known. There can no longer be claims that the Church is hiding its history. It is all right here in their new history books. Chapters 3-4 will be discussed in about 2 weeks. Here’s your chance to comment on these chapters, and prepare for the following chapters. I am excited to be a part of sharing my thoughts on Saints. I have really been inspired in my reading. I have especially loved reading the stories of incredible faithful LDS women, and I hope that my future posts will highlight some of those stories. I didn’t share comments on the Introductory material, so I wanted to start there. First of all, I loved this part of the First Presidency Message: “You are an important part of the continuing history of this Church. We thank you for all you do to build on the foundation of faith laid by our forebears.” This story of “Saints” is truly out story. As we read, we are encountering flawed and imperfect human beings who nevertheless accomplished great things. This volume does not hide the imperfections of even the most illustrious individuals of Church History (including Joseph Smith), but it nevertheless inspires great appreciation for those individuals who were tasked with laying the foundation of a great work. The book begins at the macro level focusing on the impact of a volcanic eruption in Indonesia on the Smith farm in faraway Sharon Vermont. Furthermore, the First Chapter situates the Smith fmaily in the larger narrative of American frontierism and religious revival. There is often a debate among historians about what has a greater impact on history, large scale trends, or the actions of individuals. The first chapter of Saints suggests that neither stands alone. Large trends brought a family of religious seekers into the fertile grounds of the burned-over District. Large scale trends converged to help an ordinary family make an extraordinary impact on the world. I also love thinking about what Tambora volcanos have played a role in my life. What events outside of my knowledge and my control have positioned me to where I am? This kind of thinking leads me to a greater appreciation for the hand of the Lord. For instance, economic trends in Israel and a worsening economy led to my parents seeking new opportunities in the United States. Had I grown up in Israel rather than United States, it is unlikely that I would have ever encountered the Restored Gospel. So much of who I have become was impacted by that decision spurned on my larger socioeconomic trends. This chapter touches on the well known story concerning Joseph Smith Jr.’s leg surgery. But it spends even more time on Lucy Mack Smith’s harrowing journey from Vermont to Palmyra. Her husband had gone ahead, and the driver that she hired attempted to take off with all of the Smiths’ meager belongings. Lucy called upon the “God in heaven,” publicly rebuked him and took charge of her own wagon. Her fierce independence and strength is evident. I hadn’t known that the Smith’s spent some time living in Palymra town before they could afford to purchase their farm. I suspect that this period of time in a more cosmopolitan setting was instrumental in spurring the Smiths in their religious searching. 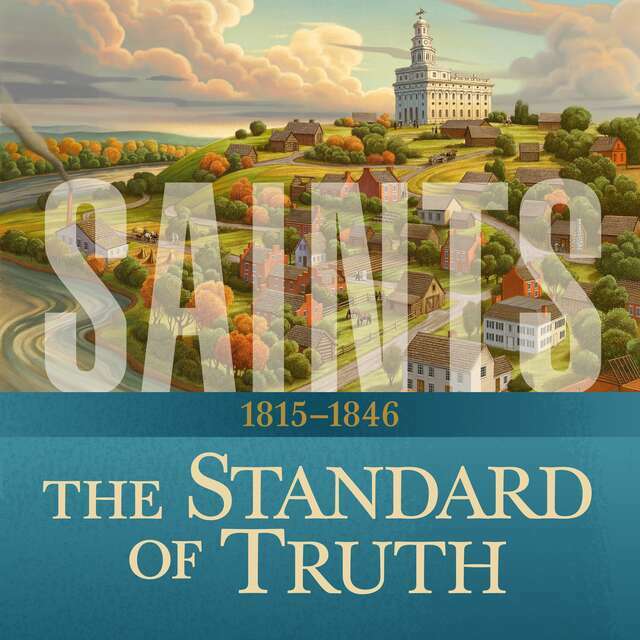 I like that the Book portrays both Lucy and Joseph Smith Jr. as true seekers. I hadn’t realized that the death of Lucy’s sister spurned her in her search, or that her own brush with mortality led her to feel that she was distant from the Lord and needed reconciliation. These personal touched really add depth to my appreciation for Lucy and all that she endured. Similarly, I like that the narrative mentions that Joseph Smith Sr. had also had religiously significant visions and dreams that warned him from participating in the churches of the day. I wish the narrative would have pointed out the similarities between Joseph Sr.’s vision and Lehi’s dream, because I find those inspiring and edifying rather than challenging. I also hadn’t realized that Joseph Smith Jr.’s exposure to James 1:5 came while he listened to the sermon of a local minister. It makes a lot of sense that the idea of praying in faith did not come Joseph Sua Sponte but had been planted by sermons and religious ideas he encountered. But Joseph coupled those teachings with a sincere conviction that God could answer his prayers, and his humble act of prayer changed history. I also really liked how the narrative explains Joseph’s reluctant to share his First Visions in the early years of the Church as coming as a result of the persecution and opposition he encountered when he first shared his vision. It also explains why Joseph’s later accounts were more focused on the need for a restoration and less with his own personal search for forgiveness. This chapter is a great introduction to some of the things that have concerned others regarding accounts of the First Vision, but still wholly faith promoting. It is masterfully done. Want to join us on the Mormon Life Hacker Facebook Live on Sunday? We discuss two chapters a week from SAINTS. Is the gospel library version missing a page? The first chapter seemed awfully abrupt, and I re-read the paragraph about JSSsr’s children four times and couldn’t find JSSjr in the roll call. I’ve really enjoyed listening to the audio version of the book, which is available as part of the book via either lds.org or on the Gospel Library app. The audio book option frustrates my husband, who wants to be able to pause and discuss, as well as dig into the footnotes. I do love (LOVE) the ability to dig into the sources used by the folks to support their narrative. I have noticed a few instances where I disagree with the conclusion promulgated, but that was more in the later chapters, where I am inordinately familiar with the contemporary accounts. I don’t expect to have anyone seriously argue with me, though, by merely citing Saints, so errors aren’t critical.